I was very busy the whole of last week with shifting, so missed many of your delicious recipes. I will soon settle down and catch up with all your post. Mushroom pulao is a very tasty and flavorful dish and can be made in a matter of few minutes. Before going to the recipe, let me share with you - how to clean mushrooms as I got some mails asking me how to clean mushrooms after seeing my Mushroom Korma recipe. Take a damp cloth and gently clean the black spots on the mushrooms. Then rinse it for a few seconds in a bowl of water or under running water. Drain the water and pat it dry with a clean towel. Now the mushrooms are ready to be used. Do not soak them in water. Thinly slice onions and slit green chillies. Heat oil and add all the ingredients mentioned under "for the seasoning". Add onions and saute until they turn transparent. Add ginger-garlic paste, slit green chillies and saute for few more minutes. Then add button mushrooms, chopped mint, coriander leaves and fry for a few seconds. Add curd and saute for a few more seconds. If cooking directly in the cooker, after adding everything, close the cooker without weight, when it is half cooked, stir the contents and close it with weight and cook on very low flame for 5 minutes. Switch off and open once the pressure subsides. Once done, fluff the rice with a fork and serve hot. Rice cooker method- transfer the contents to a rice cooker and switch on the rice cooking mode. Once cooked, fluff it with a fork and serve hot. You can prepare any tomato based gravy as a side dish for mushroom pulao. Love pulao with mushroom,serve me with some onion raita,i'll finish that whole plate.. Delicious and tempting meal..love it. very delicious recipe..looks yum ! So inviting and looks delicious !! lovely pulao dear !! very nice dish Padhu...easy too. Nice presentation.. Those four at the left inspire me a lot. You are skilled and patient to do these funny creatures..
Also, you can clean the mushroom in water mixed with Maida, so that they become clean and clear. A chef said this in a TV Show. Delicious pulao..love the presentation..looks lovely! i adore when my sis makes this, will adores urs too for sure as it looks great! I simply adore this pulav any time of the week! I made this tonight, and it is wonderful! Thank you for another great recipe, I love mushrooms and will make this again and again! For mushrooms and other ingredients along with rice, the extra half a cup i.e., 2 cups of water for 1 cup of basmati rice helps to make it perfectly fluffy. I added half coconut milk and half water for that extra taste which my wife loved + a spoon of ghee after it is prepared for bonus points. hi padhu this is harini here all ur dishes are superb extraordinary whenever i search for a recipe at google i oly prefer blog these days excellent and good job yar. Why add curd? ? What is it used for in the recipe? . To give a slight tangy taste. Instead of curd, you can add a few drops of fresh lemon juice. Delicious recipe, should I add tomato to it ? No tomatoes for this recipe but if you like you can add a small tomato. It depends on the quality of rice. Use basmati rice. 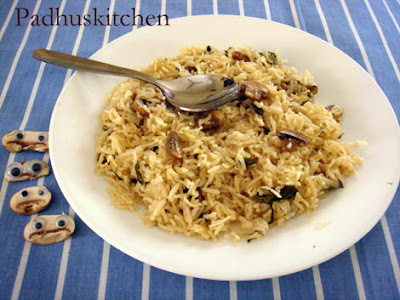 Mushroom Pulao to know in detail as to how to clean mushrooms. Can I serve it with baby corn Manchurian?? Yes , you can serve with baby corn manchurian.